This interactive presentation contains the latest oil & gas production data from 7415 selected horizontal wells in the Permian (Texas) through November 2016. Unfortunately November data for New Mexico was still not available, and therefore it is deselected in the main overviews. You can still see older production data for New Mexico if you select this state in the “basin” selections. This post will focus on the Texas side of the Permian. Not rising as strongly as in 2014 & 2015, oil production in this part of the Permian still showed significant growth in 2016 through August. Although you’ll see a drop afterwards, this is due to incomplete production data from the Texas RRC. I expect that November production will eventually be revised upwards with about 10%. In the “Well quality” overview we can see that, though fewer in number, the wells that started in 2016 again showed a productivity improvement over earlier wells, for both the oil and the gas component. The top graph in the “Well status” overview plots the number of wells put on production each month. After the very fast growth in 2013 & 2014, completions have slowed down a little, but far less than we’ve seen in the other basins. As usual, I attribute the apparent drop in the last few months to incomplete data for new wells. The last tab (“Top operators”) shows that of the main operators here, only Pioneer Natural Resources has continued strong oil production growth in the past 2 years, almost tripling its output. It’s interesting to see here that many wells from the last couple of years have now reached cumulative production of 100 kbo, but newer wells have reached this level much faster. Their decline also appears to be slower than earlier wells. The second overview (“Cumulative production ranking”) ranks all operators here by cumulative production, and reveals the location of their wells. Coming Thursday I plan an update on the Niobrara basin. 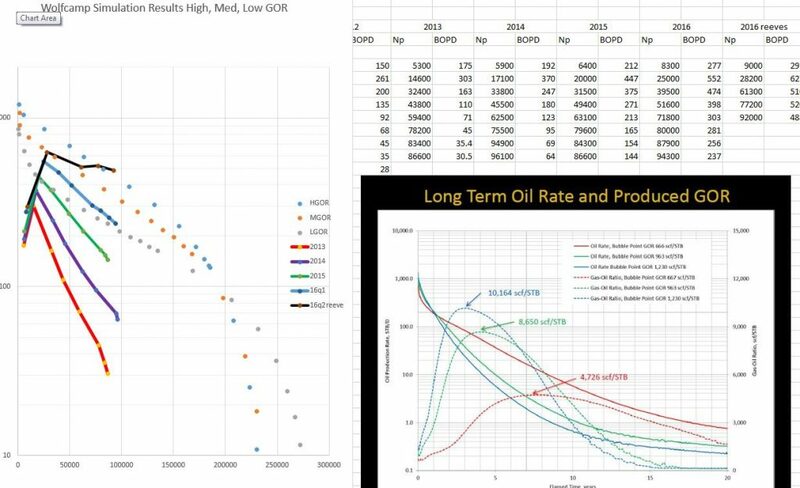 I compare the actual data as it comes in to a High, Medium and Low GOR simulation cases presented in 2014 by Apache for a 7,000′, 23 stage, 4 perf cluster per stage wolfcamp horizontal. The model has a thickness of 70′, and a width of 550′. Makes for about 100 acres of drainage. Has 1 micro-darcy matrix permeability. If one were to accept this as “theoretical” behavior, and overlay the actual average performance on it, one may be able to estimate anticipated future behavior. As shown below, it took about 10,000 Permian wells to get into the “cloud” of simulator behavior in the first quarter of 2016. It appears that the 1q 2016 risk breaking the downside of this “cloud”. The Reeves County 2q 2016 wells are bumping the high side of this cloud. This cloud defines a region of Ultimate Oil Recovery at 10 BOPD from about 230-270 MSTBO. Is it possible to get access to your raw data set? 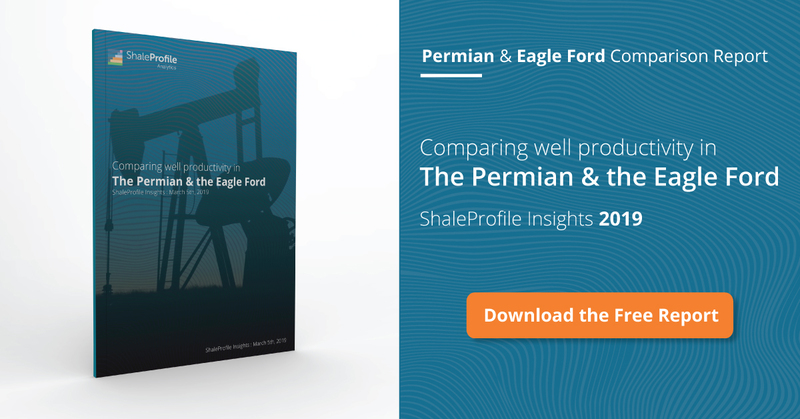 Regarding the Permian: Do the data cover all the horizontal Permian wells? > Do the data cover all the horizontal Permian wells? In the Texas side of the Permian : about 93% of the horizontal wells are included. I have excluded the other 7% as I determined that the accuracy of the production estimation for those wells was not high enough. These wells are located on leases with too many other (typically old) vertical wells, which is a problem for the algorithm used. thanks for the clarification. I looked at your 2015 Permian data. For 2015, you have 1968 wells with first flow. Assuming that completion precedes first flow by one month, I look at the EIA Permian completion numbers between Dec 2014 and Nov 2015. The total is 4324 wells. Can we say that 4324 less 1968 approximates the number of vertical wells in that period? That probably would be in the right ballpark. Another thing to watch out for is the exact area covered. I define the Texas Permian by the Texas RRC districts 7C, 08, 8A. This may be slightly different for the EIA. I agree that the last few months are quite incomplete (typical for especially Texas), and given the sharp increase in rig count in the Permian, I also would not expect a drop in production. NM data isn’t shown here this time, but the latest NM data is included in my last US update, and the data already showed a production increase.